This reverse legend is constantly recurring on coins from the time of Constans and Constantius II to that of Gratian (AD 337 to AD 375). Although the intended reading of this legend is debated and not completely certain, it most likely reads, FELicium TEMPorum REPARATIO, meaning "re-establishment of the happy times" (happy days are here again!). Mattingly, Harold. "FEL. TEMP. REPARATIO," Numismatic Chronicle. 1933, pp. 182-201, and plates xvii and xviii. An article from 1933, reprinted as a short booklet in the Numismatic Chronicle Reprint Series; New York Attic Books, Ltd. 1977; ISBN 0-915018-22-5. This is a handy little booklet setting out Mattingly's ideas about the types found on the various coins on the FEL TEMP REPARATIO series of the late 340s and early 350s. He also covers the naming of the coins of the period. Worth having, but Mattingly himself suggests some caution in accepting his theorising. This review is more of an abridged and incomplete version rather than a critique or analysis of the article. I should add that this about the article its self, and not the articles accuracy. Also, the article goes into much more detail than is presented here, in particular about the denominations and reformations of the coins and I recommend reading it for further study as I have found it enjoyable. Mattingly then begins to give his interpretation the words "Fel. Temp. 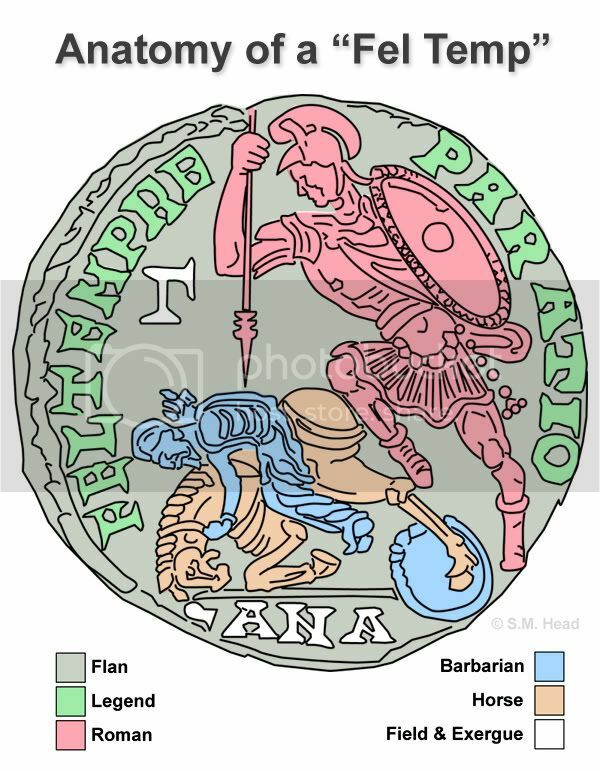 Reparatio," either being Felix, or Felicium, Temporum Reperatio, favoring Felix which “seems to fit in with the Roman cry of good luck.” The words refer to a anniversary, or “golden age” of 348 A.D as a "happy renewal of times". He then go into some detail about the Etruscan (Secular Games), and Roman (the anniversary of Rome) Saeculum celebrated every 110, and 100 respectively, citing examples on record, and on coinage. The two saecula coincided in 348, and Mattingly the explains 100x11=1100 and 110x10=1100, which becomes more relevant later on in the article where he discussed the introduction of the centenionalis (1 piece of 100 units) and miliarense (1 of 1,000 units). He briefly discusses the types and sizes, and which are mostly attributed a certain emperor or mints, and notes the intermediates type from Aquileia bearing the mark LXXII perhaps meaning “72 to the pound.” He then discusses his the ideas on themes of the coins, there is no obvious relation between the images on the reverse with the legend, but “must in some way bear on the one central idea that binds them together.” The first interpretations as: A renewal of times (the Phoenix) , military prestige of Rome (Emperor and captive), successful government of the state (the Galley), the legionary overthrowing the Persian cavalry (Fallen Horseman), and the legionary leading the barbarian to leave his forest home for settlement in the empire (the Hut type). Mattingly seems to suggest a religious and political neutrality between Pagan and Christian, as well as between Christian and Christian (Arianism and Athanasius), with a “general political or military character, with slight reference to religion” on the coins, unlike some coins of Magnentius. Mattingly then suggests the possibility of a theme inspired by Virgil. The Galley type taking on the meaning of “new adventure in the unknown seas of the new age,”for example, or further suggestions, and question about the “Hut” types. Is it a barbarian, or a boy, being “led” out? Or perhaps Mars leading his son Romulus to his military career? He advises caution in accepting these suggestions however. He then, as mentioned before, discusses the denominations and reformation of the coinage and so on, and ending with the “barbarous” imitations of the type and a plate (with a few mistakes) of 50 coins. 1. The phoenix standing on a pyramid of steps, with a wreath in its beak, or attaching a branch of laurel to the prow of a ship. 2. A galley, on which the emperor paludated stands with a phoenix in his right hand. 3. On another specimen the emperor, in military habiliments, stands on the prow of a galley, holding in his right hand a globe, surmounted by a Victoriola, and resting his left hand on a labarum, bearing the monogram of Christ, whilst Victory is sitting at the helm. 4. A soldier dragging a barbarian, by the hair of his head, from a hut or wooded retreat. 5. A soldier, dispatching a prostrate horseman with a spear (Engraved in Constantius Gallus, p 265). 6. The emperor standing, with a banner in his right hand, and two prisoners sitting on the ground beside him. 7. The emperor on horseback, charging the with levelled lance, a prostrate and suppliant enemy. That these coins (says Eckhel, viii p 111) saw the light after the death of Constantine the Great and Constantine II, father and son, is rendered certain by the fact that no authenticated coin of the kind has been seen which exhibits the portrait of either. They require no explanation, as they present well known, or at least intelligible, symbols of a felix temporum reparatio; especially in the phoenix, a figure exhibited on the reverse of a coin of Plotina, and also on one of Hadrian with the legend SAEC AVR; and on no occasion with a happier application of the type, than when the intention was to indicate a restoration of the times, in accordance with the accounts, which ancient writers have given of this marvellous bird. See Taticus, Pliney, and others, as also a long-winded poem about the phoenix, attributed to Laetantius. An article originally published in Numismatic Chronicle, 1933, pp. 182-201, and plates xvii and xviii. Mattingly discusses his ideas about the various coins of the FEL TEMP REPARATIO series of the late 340s and early 350s.